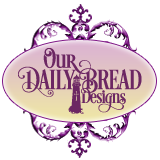 Welcome to the Our Daily Bread Designs November 2016 Special Holiday Release! Christmas is only a little over a month away, there is still time to create quick Christmas cards for your friends and family! My first card features the new ODBD Christmas Ornament Clear Stamp Set along with the new coordinating ODBD Christmas Ornament Die and ODBD Holly Jolly Christmas Collection 6x6 Paper Pad as well as the previously released ODBD Bitty Borders Dies, ODBD Lovely Leaves Dies, ODBD Mini Bow Die and the snowflake from the ODBD Beverage Cup Dies (used as a stencil). My second card features the new ODBD Christmas Ornament Clear Stamp Set along with the ODBD Christmas Ornament Die, ODBD Snowflake Sky Die and ODBD Mini Bow Die. Three randomly selected winners will each receive a $25 Gift Code to the ODBD Website just for commenting on the Design Team cards! You have until November 16, 2016 at 9:00 p.m. EST to leave your comments on the Designers Blogs for a chance to win! The Winners will be posted on the ODBD Blog on November 17th, so be sure to check back there to see if you won! Oh Julie, love your ornaments my friend!! I especially love the gold and white and must do one!!! I love your first too with the stenciled snowflakes, what a great idea! So pretty. I like the greenery on the first and the white and gold on the second. These cards are so striking. The first with the bright Christmas colors and the second with all the wonderful texture! Great job! These cards are lovely. I especially like the second one. Such beautiful cards!! Love the red and white combo of the first card! The addition of the pine branch adds a nice touch. The second card is so elegant! Love that gold and white! Beautiful and worthy of a frame for sure!!! Two totally different styles in coloring, but both equally elegant! Both of your cards are stunning, Julie!! I so love your red and white with the dp and added die cut foliage on the first and the sheer elegance of the white and gold with the cording on the second. Gorgeous work!! Very beautiful cards. Love the red and green on the first card and the white card with the embossed background is gorgeous as well. 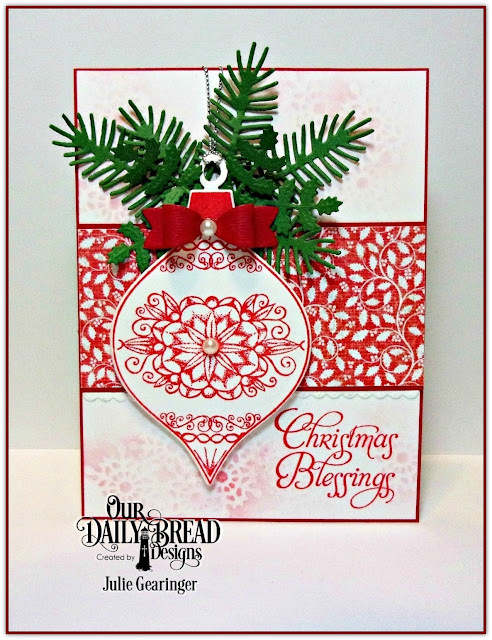 Just love that holiday ornament stamp! Ooooh both cards are just spectacular Julie!!! I love the layouts you used and the beautiful greenery! Your color combos are just perfect!!! Just love them both!!! I adore both of these stunning Christmas cards! Beautiful and festive!! Your cards are stunning; I absolutely love the colors and elegant look. Keep up the great work!! Love, love, love your cards! Thanks so much for sharing your beautiful work with us!! Fantastic cards!! I love the elegant second one the most!! Beautiful cards! Love the ornament and the pretty pine sprigs on your first card! Great holiday color combo too! And the second card is so elegant in white and gold! Love the snowflake background! Beautiful details! Gorgeous cards, Julie!! Love your creative snowflake stencil!